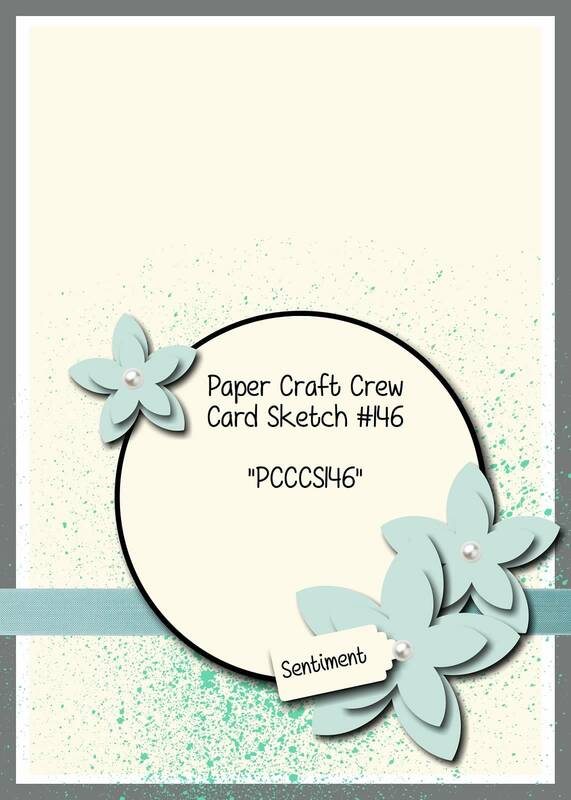 Welcome to another sketch challenge with the Paper Craft Crew, stamping friends! I hope you’re ready to play along with us – we have another great sketch for you to start your creative engine! I decided to mix the current with a new stamp set that I got in my pre-order – I think you’ll like it! 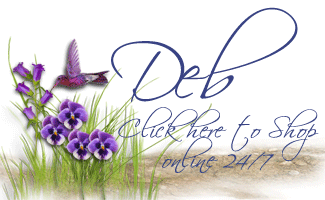 I really wanted to use the new Hostess Set called “Best Thoughts” – I just love the flower image. I decided to emboss it, so I stamped it in Versamark Ink, and heat embossed it using Gold embossing powder. I did the same with the butterfly image, as well, to tie them together. I coloured the flower using my Aqua painter and Blackberry Bliss ink; the leaves were coloured using the Aqua painter and Old Olive Ink. I decided to use the same colours and technique in colouring the butterfly too. 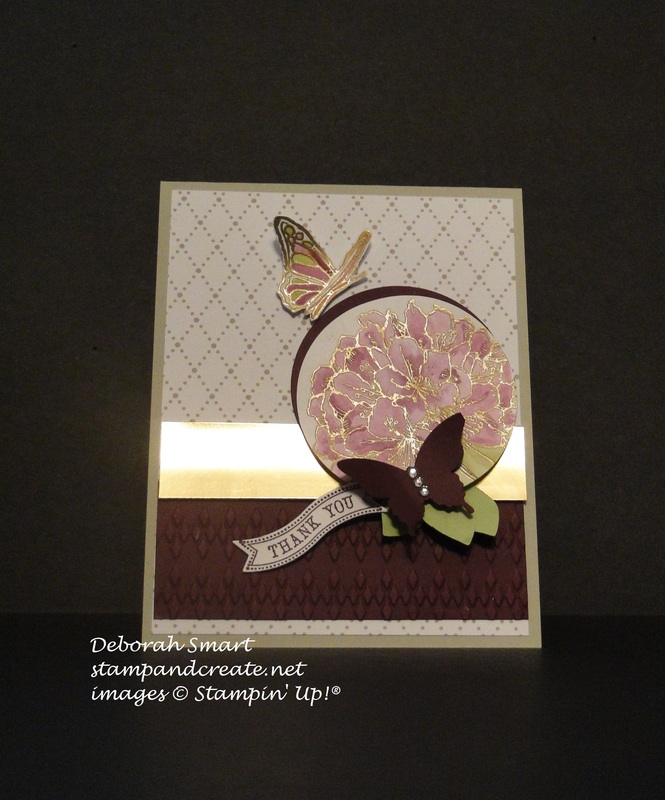 I used the Elegant Butterfly punch to punch out a butterfly from Blackberry Bliss cardstock. I started with a card base of Sahara Sand, and then layered a panel of Something Borrowed designer series paper. I embossed a 1 1/2″ piece of Blackberry Bliss cardstock using the Argyle embossing folder, and layered a 3/4″ strip of Gold Foil paper on top of that. I punched the flower image using the 2 1/2″ Circle Punch, and layered it on top of a 2 1/2″ Circle of Blackberry Bliss cardstock. I used the Flower Fair Framelits to cut the leaves from Pear Pizzazz cardstock, and stamped the sentiment from the Bitty Banners stamp set, and cut it out using the Bitty Banners Framelits. I finished the card off by adding 3 of the smallest rhinestones to the middle of the butterfly. Please come over to the Paper Craft Crew page, and see all of the wonderful cards that the Design Team have made for your inspiration! Then I hope you’ll join in the fun – create your own card using the sketch as inspiration, then link your card to the challenge. Next Next post: Celebrate the Guys! Thanks, Buffy 🙂 I appreciate you coming & leaving a comment – you’re such a nice friend!